This event, for individuals without a technical background, will provide an introduction to Virtual Reality (VR) and Augmented Reality (AR) technologies and their powerful applications to address issues relevant to the work of the Member States of the United Nations. Opening Remarks by UNITAR and UN-OICT. This session will include presentations by pioneers and experts of the VR and AR field who will discuss how these technologies can support their work of United Nations Member States and the United Nations system in tackling global Issues. Ms. Anna Therese Day - award-wining reporter, 360-degree video filmmaker and social media researcher, who is also a regular contributor to the New York Times, and co-founder of Forth Studio for VR documentaries. Ms. Vassiliki Khonsari - Co-Founder of iNK Stories, award winning game designer well known for creating cinematic look and feel for groundbreaking VR games with a high humanistic mission”. Mr. Mark Skwarek - CEO of Semblance Augmented Reality and the director of NYU's Mobile Augmented Reality Lab with a long record of international AR work. Ms. Debra Anderson - Co-Founder of Datavized Technologies, a software company building data tools for non-technical users, including an immersive visualization platform using WebXR. She is also teaching WebXR at The New School, Parsons School of Design. Q & A: After the panelist interventions, the floor will be open to questions from audience (30 minutes). This session will provide hands-on VR and AR experiences for participants. Anna Therese Day is an award-winning reporter, filmmaker, and social media researcher. On the ground in the Middle East and beyond, Day's work focuses on US foreign policy, women's issues, climate change, and youth movements. Day is a 2018 Atlantic Council Millennium Fellow, a recipient of the 2017 Forbes 30 Under 30 in Media, a 2016 Truman National Security Fellow, 2013 Fulbright Fellow, a 2012 United Nations Press Fellow, and was named one of Google Zeitgeist’s top 30 Great Young Minds of Our Time in 2011. Day is the co-founder of Fovrth Studios, an independent production house specializing in Virtual Reality documentary. Day's latest VR documentary series, AUTHENTICALLY US, was selected for premieres at SxSW, Tribeca, Cannes, Sheffield, and American Film Institute Docs film festivals in 2018. Vassiliki Khonsari is Co-Founder of iNK Stories -- an entertainment company and a production studio creating visionary stories that elevate, entertain and engage audiences. With offices in New York City and Los Angeles, iNK’s outstanding team is at the forefront of storytelling and technology. Our award winning cinematic and interactive projects have garnered top honors from institutions such as BAFTA, Sundance, Tribeca, UNESCO, Academy of Interactive Arts & Sciences (DICE), International Mobile Game Awards, IndieCade, Bit Awards and more. Independent Magazine called Vassiliki among “10 Filmmakers to watch in 2015”. Prior to establishing iNK, Vassiliki received her MA in Visual Anthropology (UK). Khonsari has received support from The Doris Duke Foundation, IFP + MADE IN NY Innovation Grant and a fellow of the Sundance Institute at the New Frontier Story Lab. Winner Storyscape Jury Award, HERO @Tribeca '18, Facebook Game of the Year, BAFTA, DICE - 1979 Revolution. Consults and contributes to the landscape of art + technology + impact storytelling— as a mentor/speaker for FoST, iDocs in Bristol UK, Euro Transmedia projects at iDocs in Switzerland at Visions du Reel ’15, Magnum Photo, Change Through Story and conducting workshops with Film Forward (A Sundance/NEH Initiative) and guest lecturing at universities including Princeton. Mark Skwarek is an artist working to bridge the gap between virtual and physical world with augmented reality. His art explores the translation our everyday digital experience into the physical world using mobile augmented reality. Skwarek earned his M.F.A. from Rhode Island School of Design's Digital Media Department. He is full time faculty at New York University's School of Engineering, the CEO of Semblance Augmented Reality and the director of NYU's Mobile Augmented Reality Lab. He teaches 3D Graphics and the Augmented Reality Grad Class. He organized the augmented reality artist group manifest.AR, the arOCCUPYWALLSTREET movement, and co-organized We AR in MoMA. Skwarek’s practice is also largely based in art activism with emerging technologies. He has a long record of international augmented reality work, ranging from “erasing” the DMZ battlements between North and South Korea (a piece he did on site), to the virtual elimination of the barricades between Palestine and Israel, at the Gaza Strip. He has created political work and symbols in a variety of locations across the United States, including pieces at Wall St., U.S. Mexico Border and the White House to name a few. His artwork has been written about by the New York Times, Art in America, Boing Boing, WIRED, the Boston Globe, The Huffington Post, NPR, BBC, the Discovery Channel, Leonardo, and Creative Capital. Ms. Debra Anderson is Co-Founder and Chief Strategy Officer of Datavized Technologies, Inc a New York City-based startup building data tools and an immersive visualization platform using WebXR for projects such as UN Environment global PM2.5 air pollution and NYC Smart Cities. She is an entrepreneur with expertise in digital media, marketing communications and storytelling and brings this experience to the development of innovative software tools and product design. In 2017 Debra was selected by Sundance Institute for the New Frontier Story Lab for her innovative approach to WebVR and emerging media storytelling. She is the director of In/Formation Part 1 & 2 a 360 video documentary about VR in VR, has produced WebVR for Mozilla, The National Film Board of Canada, UN Environment and is currently developing data visualization and sonification tools with the support of Google News Lab. In March 2018, Debra presented XR at the Global Partnership for Sustainable Development Data's inaugural Data for Development Festival in Bristol, UK. She is Adjunct Faculty at The New School where she designs and instructs undergraduate courses on WebXR and Big Data: 'Digital Development WebXR' at Parsons School of Design and 'Big Data Consumer Research' at the School for Public Engagement. She also teaches WebXR at the International Center of Photography New Media Narratives Program and has guest lectured at Harvard, MIT and NYU. Passionate about community building, she also founded and organizes the Immersive NYC Meetup group. 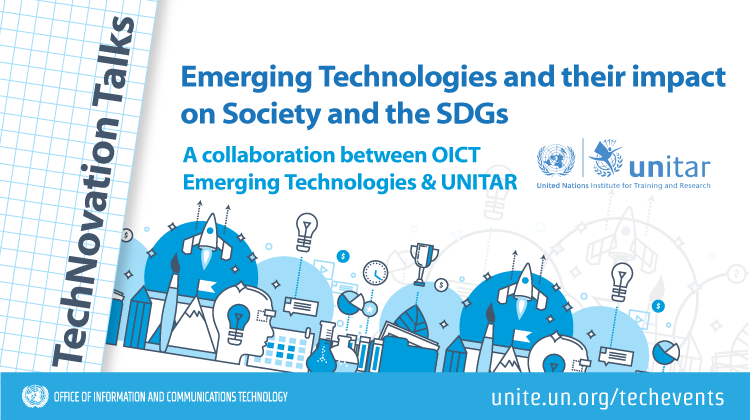 OICT organizes this ongoing series of conversations to raise knowledge among Member States, Civil Society, and UN personnel on innovative ways in which technology can be applied to our work.